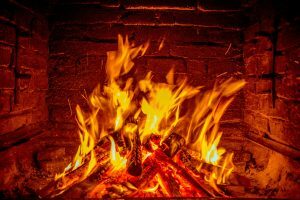 Does a Chimney Sweeping Log Work? Yes, a chimney sweeping log works, but it doesn’t replace an inspection or professional cleaning. They’re not useless or dangerous. Chimney sweeping logs will remove some of the creosote buildup in chimneys. In fact, the Chimney Safety Institute of America has granted the Creosote Sweeping Log the status of ‘Accepted Product’. Each chimney that’s in regular use needs to be inspected every year and professionally cleaned. It’s obvious if you consider how a chimney works. Burning wood in a concentrated area will buildup soot, or creosote, in the chimney flue. Over time, that creosote becomes thicker and eventually can cause a major house fire. That’s a little dramatic, but it is true. Thousands of house fires are caused by uncleaned flues each year. This is one of those cases when you’re asking yourself , “Do I really need to hire a chimney sweeper?” Absolutely! Hiring a professional chimney sweep to help you maintain your heating and chimney systems can prevent issues from becoming major problems down the road. Of course, there are other tips you can implement to help support your chimney and fireplace maintenance. Hopefully you’re using well seasoned wood that was split between 6 months to a year and has been stored in a cool, dry place. That’s what the Chimney Safety Institute of America recommends you do. Also, avoid using pine as a regular wood source in your wood burning stoves or fireplaces as it creates higher levels of creosote build up. They also recommend scheduling a yearly inspection by a licensed professional. Another option is to use a chimney sweeping log, but remember: a chimney sweeping log doesn’t replace annual inspections and professional cleanings. What exactly is a chimney sweeping log? A chimney sweeping log (or CSL) is a ‘log’ that you throw in your fireplace, woodstove, or smoke shelf and light on fire. As it burns, additives in the smoke work to loosen the creosote deposits that have built up in the flue over time. CSLs are relatively inexpensive. You can pick them up at any local hardware store for less than twenty dollars. Some of those additives can have negative side effects. For instance, some reviewers on Amazon commented that it can add an unpleasant chemical smell to your home. If you or your loved ones are sensitive to these types of smells, we would recommend not using a CSL. For the most part though, Chimney Sweeping Logs have a good reputation. A CSL cannot take the place of an annual inspection. It won’t alert you if there are cracks, a bird’s nest, or any structural damage. Chimneys in Western North Carolina aren’t in use all year, and during the warmer months, birds or small woodland creatures might make their home inside a dormant chimney. Furthermore, structural damage is not always something you can see. We utilize state of the art video scanning to ensure any problematic areas are not missed. A CSL is not as effective as a mechanical wire brush. Sometimes a wire brush won’t get off all of the creosote. Stage 3 Glaze creosote, which looks just like a shiny glaze on the inside walls of a chimney, requires a chemical compound to loosen it before attempting removal. Think of a CSL like a toothbrush. You need to brush your teeth twice daily, but you also need to schedule regular ‘inspections’ and cleanings with a dental professional, otherwise you won’t know if you have a cavity or need a root canal. Of course, you don’t want to use a CSL twice daily. That’s exactly how a CSL operates. Sure, they’re great for removing some of the regular creosote buildup. But, if you haven’t had the chimney swept recently, it’s not going to get off major buildup. Major creosote buildup is what causes chimneys to catch on fire. It’s imperative that you get your chimney inspected every year. Based on a certified sweeper’s recommendation, you may need to get it cleaned or have some minor repairs scheduled. CSL’s are not bad – but they should be used as one part of a regular chimney maintenance plan. If it’s been a year or more since you’ve had your chimney inspected, call us at your earliest convenience. Appalachian Chimney Service can inspect, clean, and inform you on any ‘over the counter’ chimney products.